In their twenty-five year recording history, Rose Royce music is currently being played on radio stations all over the world, such sensations as “CAR WASH” “Wishing on a Star”, “I Wanna Get Next To You“, just to name a few. the world and perform at sold out venues world wide. 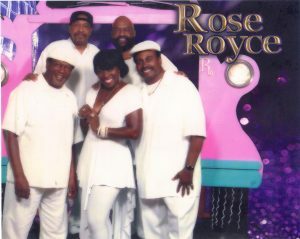 Although ROSE ROYCE is best known for their great ballads, they are one of the funkiest bands around. Dazzling audiences worldwide, ROSE ROYCE currently tour the United States as well as other parts of the world with their amazing and exciting show. The Grammy Award Winning, Multi Platinum selling Group Rose Royce has sold millions of copies of the album “Car Wash,” “In Full Bloom,” and “Rose Royce Strikes Again” just to name a few of their Platinum selling CD’s. and has successfully managed to stay fresh and attract new fans.